Owners Fail To Appear In Court, Now On The Run. Dogs To Be Euthanized. There have been a few new developments in the case of Donna Berto, the woman who was mauled in a pit bull attack outside of a shop in Tacoma last August. There was a dangerous dog hearing recently in this case---the owners of the dog were appealing The City of Tacoma Animal Control’s dangerous dog designation. Case: Devin C. Cannady v. City of Tacoma, Animal Control and Compliance, File Nos. HEX2O15-033 (Bandit) and HEX2O1S-034 (Paws aka LaLa). 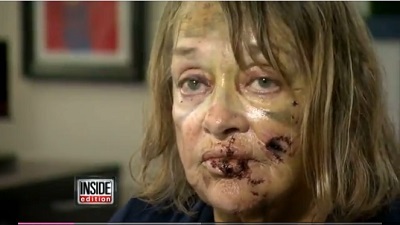 Pictures: Top: Donna Berto, pit bull attack survivor. Bottom: Johnny Cannady, dog owner. Appeal Denied: Yesterday The City of Tacoma has denied the dog owner’s appeal. Failure To Appear: The owners of the pit bulls, Johnny and Devin Cannady, did not show up for their arraignments in the Pierce County Superior Court yesterday. Warrants Issued: Bench warrants have been issued for the arrest of the owners. Dogs To Be Put Down: The City of Tacoma Hearing Examiner ordered that the dogs will be euthanized.